The existence of ghosts divides opinion; firm believers are forthright in their views, but science rails against them. Like most divisive issues, there is a middle ground, and in that middle ground are the intrigued skeptics. They are the people who are interested, but need to discover the truth for themselves, whatever that truth may be. It is human instinct to investigate that which we are unsure of, and in order to come down strongly on one side in this debate, we must investigate. Popular culture has created a paranormal obsession, and polarised the interest of viewers and readers all over the world. Films like Paranormal Activity have deviated from the horror genre convention in producing a work of fiction that sells itself as a real life story. They are set in what appears to be the homes of real people, and packaged with grainy amateur camera work to fulfill this effect. This has brought the paranormal interest into the lives and homes of the people consuming the movies. Paranormal research and investigation groups have popped up all over Ireland; the Paranormal Research Association of Ireland, Paranormal Study and Investigation Ireland, Dublin Paranormal Research, and so the list continues through the counties. Every weekend, these teams bring interested members of the public to locations reputed to be haunted; from graveyards to castles, manor houses to hotels. Rather than accepting individual tales of the paranormal, these groups attempt to find reasonable scientific and natural explanations for the goings on. Nine times out of ten, they can find these explanations, but that ten per cent of the time, there is that one thing that serves their very existence; doubt. With doubt comes more room for investigation, and my own doubt led me to one of Europe’s most haunted castles; Charleville, Tullamore. I was accompanied by investigators from Dublin Paranormal Research and the Paranormal Research Association of Ireland, as well as a group of other curious members of the public. Charleville Castle was built between 1800 and 1809 by Francis Johnston, the same architect responsible for the design of Dublin’s GPO. The source of its paranormal reputation stems primarily from one ill-fated little girl, and the tragic circumstances of her death. I met with Bridget Vance, an American woman who has lived in Charleville Castle for twenty-four years, and she told me the story of this little girl. Her name was Harriet, and she was the daughter of the 3rd Earl of Charleville. In April 1861, Harriet was expecting her friends and relations for a mid-summer party, and was playing in the castle’s nursery. The nursery is located on the third floor of an old creaking staircase that turns on itself through the centre of the castle. Bridget told the story: “Harriet was looking over the railing for her friends, but the railing is low, and she leaned over too far and fell to her death.” Bridget only discovered Harriet’s story after her own son went missing in the castle as a toddler. After searching for over an hour, Bridget found her son on the main staircase, and she recalls him saying, “don’t worry Mommy; the little girl held my hand.” Bridget wholeheartedly believes the little girl her son referenced was indeed Lady Harriet. This story sparked an interest, and led me to a night of investigation. Loftus Hall is widely regarded as one of the most haunted buildings in Ireland. Located on Hook Head in County Wexford and the subject of legends and reported paranormal activity, we decided to send Trish and Joanna along to check it out. I can see her very well. But what is that behind her at bottom of photo? Looks like a mans head to me. What a horrible thing to do to your own daughter.. I think there is two Ghost in this photo, if that is what they are. Is that a window or a door? Could those be people inside the house looking out the window? How come none of the people standing right to the ghosts don't see them? They are kind of see though like a ghost would be but I dunno.... The y look kind of like real people inside the house. I can't tell if that's a window or a door tho. I don't see any other windows down at the bottom of the house. It looks weird. They don't really look like window reflections of any of the people on the outside. I notice that the sun is shining on their faces from the same direction as the people outside which also makes me think the "ghosts" are not reflections because if it was a reflection it would be the opposite. I'm kind of wondering why sunlight would reflect off of a ghost at all though. Since when do ghosts reflect the sun? I think youre right about the reflections in the window. That doesn't look right. But if they are real people inside the house why is the old ladies head so low? She would have to be down on the floor to be that low. Maybe they really are ghosts after all. That's kind of cool. 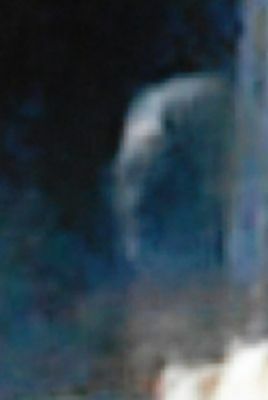 Could this be a ghost crossing the road and disappearing through a wall and into the grounds of a Cathedral? This footage was apparently recorded on a dash cam at Vicars Hill in Armagh, Northern Ireland, just outside the grounds of the Church of Ireland Cathedral. The person who shared the footage wants to remain anonymous but they sent the footage to Armagh I news site saying that their grandmother recorded the footage on her dash cam. 1. A grandmother sporting a dash-cam. I like it! I like it!! 2. I'm willing to bet that there once were steps there where the "ghost" appears to step up before going through a short wall and fence. 3. A benign shadowy figure only going about its business. Makes me wonder if this is sometimes what I see as "shadow people" (nothing sinister). Look close it seems to me he is wearing a three corner hat. He seems to be from the 17 century. Wow. The Irish haven't "given up " their ghosts. Therefore their ghosts are free to walk and exist peacefully. A CCTV camera installed at a secondary school appears to have caught some spooky goings-on in the corridors late at night. 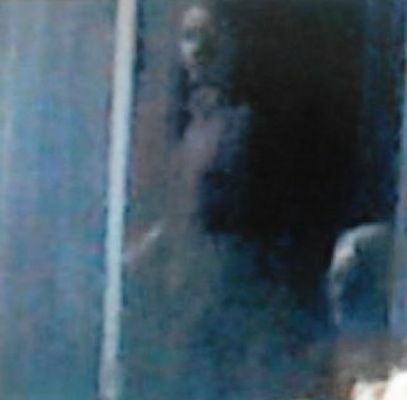 Deerpark CBS in Cork, in the Republic of Ireland, released that footage which they reckon could show a ghost. The footage begins with a huge bang and some strange flashes, that seem to be coming from behind a closed door. Moments later, lockers begin to shake uncontrollably, reports the Irish Mirror . And things get really weird when a locker door flies open by itself, spilling books and papers onto the floor. Just for good measure, at the end of the footage, the wet floor sign that has been placed outside the toilets is knocked over. The footage appears to have been captured just after 3am on October 1, a Sunday morning when the school would have been closed for the weekend. Posting on their Facebook page, Deerpark CBS said: "Anyone have the number for ghostbusters?" Whether or not it is actually a poltergeist or a prank by students is anyone's guess. They added: "We're such a great school even the afterlife are signing up lol." NEW GHOST caught on camera? Interesting that the ghost was grabbing stuff far away and then closer and closer. Like he was walking down the hall. Don't know why a ghost would walk down a hall tho. Maybe cuz that's what they did in real life? Along the scenic coastline of Ireland there is a rural, isolated road that meanders by the seaside of the Hook Peninsula County, in Wexford. The road makes its way past windswept vistas and rugged rocks and cliffs ceaselessly pounded by the waves, presenting a rather breathtaking view, yet driving along further one will invariably see a rather surreal site looming in the distance. There not far from the craggy coast sits an enormous and very old country house that towers over the flat landscape around it, obviously once opulent but now appearing derelict and battered by age and the elements. This is the historic Loftus Hall, also sometimes referred to as the Hall of Dreams, a place infused with a tragic and at times violent and sinister history, and which has grown to acquire a reputation as being one of the most haunted places in the country. The past of this place is rather colorful to say the least. There was a time long ago when this was a sacred land infused with magic and revered by Celtic druids, who used it for their rituals, and is also said to have once been a pagan sacrificial ground. For the druids this was a place of great power and magic, the realm of their legends and mysticism for thousands of years, but they eventually drifted away when the Normans took over the area and built an imposing castle right atop this sacred place in around 1180. This castle, then known as Houseland Castle, was erected by the Norman knight Raymond (Redmond) Fitzgerald, also known as Raymond Le Gros (Raymond “The Fat”) shortly after moving into the peninsula. From there the castle would gradually become a decrepit ruin until Fitzgerald’s descendants rebuilt it in 1350, in an era when the Black Death was menacing the land to bring death to all in its wake, calling it Redmond Hall. It is from here that the history really becomes interesting. In the 1600s the Irish Confederate War broke out, and the castle would be repeatedly subject to attack by English forces, with the Redmonds proving to be able to tenaciously defend it at all costs. One famous story is that of the valiant fight of 68-year-old Alexander Redmond, who managed to fend of around 100 troops with just his resourcefulness and the help of his two sons and some tenants, killing most of the enemies and capturing and executing the rest. They would continue to successfully defend the castle, but as heroic as these deeds were, the hall eventually fell to the English and was confiscated. In 1666 the hall would fall into the hands of the prestigious Loftus family, and would be renamed Loftus Hall. From between 1870 and 1879, the increasingly powerful and illustrious family went about a complete renovation and overhaul of the place, sparing no expense to make it a residence worthy of a visit from Queen Victoria herself, who they hoped to woo there with its granduer. The hall became even more opulent than it had ever been before, decked out with marble and mosaic tiled floors, tapestries, ornate staircases, the works, and although the Queen never did see it Loftus Hall became known as one of the most luxurious residences in all of Ireland. The house would eventually fall into disrepair once more, and later sold to the Benedictines, who turned it into a convent and girl’s school called the Convent of St. Mary’s in 1917, who would in turn pass it on to the Sisters of Providence of the Rosminian Order in 1937. The hall was then eventually abandoned yet again and stood there alone, isolated, and uninhabited for decades, only finally being sold in 1983 to a man named Michael Deveraux, who made it into the “Loftus Hall Hotel.” This would not last long, as Deveraux would die not long after, and his wife would then mysteriously vanish for no appatrent reason. The house stood unoccupied for several decades more, until it finally passed on to the Quigley family, who are its current owners and have turned it into a historic site open to the public. Throughout all of this the hall remained abandoned and feral for long stretches of time, and one reason for this was that it has long been considered to be a cursed place brimming with the forces of evil, due to a persistent legend surrounding its halls that dates back to the 17th century. The story goes that in the year 1666 a caretaker named Charles Tottenham came to Loftus Hall along with his wife and daughter, Anne. One stormy night a ship is said to have crashed against the rocks at Hook Peninsula, after which a mysterious stranger made his way to the mansion through the lashing wind and rain. The Tottenham’s graciously let him in out of the storm and offered him shelter, and he would end up being there for several weeks while his battered ship was repaired, in the meantime making quick friends with Anne, with some versions of the account even saying they fell deeply in love. According to the tale, one night the family and the mysterious stranger were playing cards in the Tapestry Room when Anne dropped one of her cards and bent down under the table to retrieve it. When she did so she purportedly noticed that the stranger’s feet were now cloven hooves, which caused to her to shoot upright and scream. The mystery man, now certain that she had found out his dark secret, then shot up straight into the air, smashing through the roof, in some versions transforming into fireball, and flying off into the night to never be seen again. Shortly after this, Anne is said to have gone stark raving mad and confined to one of the mansion’s rooms to her dying day. Interestingly, her grave was cemented over and sealed for reasons unknown. The hole that the Devil made in the ceiling is said to be irreparable to this day, always breaking again, and even in modern times it is said that this portion of the ceiling looks different than the rest. From the time of her death onwards, Loftus Hall became well known as being a haunt of the Devil, as well as an intensely haunted place in general, with the restless spirit of Anne said to prowl the estate. Indeed, the hall had such a reputation for being haunted that on many occasions Catholic and Protestant priests were brought in to exorcise it to no avail. The ghost of Anne Tottenham has remained active all the way up into the present, allegedly known for spooking visitors to the hall and photobombing pictures taken by people on the tours that pass through. There are also ghostly horses said to roam the grounds, as well as apparitions of long dead British soldiers and a dark shadow entity that some speculate is the Devil himself. Add to this the reports that the location was used by Satanists for dark rituals during its long periods of abandonment, and you get a place charged with a dark history, death, curses, and the Devil, and Loftus Hall is often mentioned as one of the most haunted places in Ireland. It is partly these ominous tales that the locations remained unwanted and forgotten for such long periods of time. Of course with such a dark reputation the hall has become of interest to ghost hunters from all over the world, and one of these was the TV program Ghost Adventures, with Zak Bagans, Aaron Goodwin and Nick Groff. The team apparently ran into all sorts of paranormal activity at the hall, although it is all so dramatized and pervaded by theatrics that it is hard to know what veracity any of it has. It certainly seems that with its checkered past tinged with tragedy this place might keep spirits tethered to it, but there is very little we can do to untangle the myth from reality. 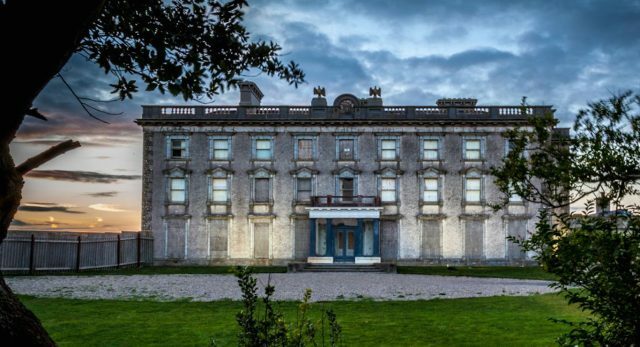 Whether it is really haunted or not, Loftus Hall is certainly a place with an interesting past, and it maintains its haunted status to this day.